MIAMI, March 17, 2018 /PRNewswire/ -- Piaggio Fast Forward (PFF), a company focused on the intelligent movement of people and goods, today joined over 2,500 people in the Best Buddies Friendship Walk in South Florida, bringing along its flagship product, Gita. 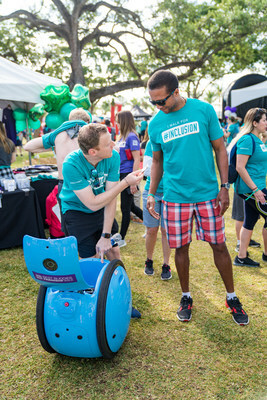 Gita, a mobile-carrier that follows humans on the go, enabling them to move with ease and convenience while carrying up to 44 pounds, helped to lead the walk by following Best Buddies founder, Anthony Shriver. Carrying water and supplies to help keep the walkers fueled, Gita proudly rolled alongside participants to raise awareness and support inclusion for individuals with intellectual and developmental disabilities. 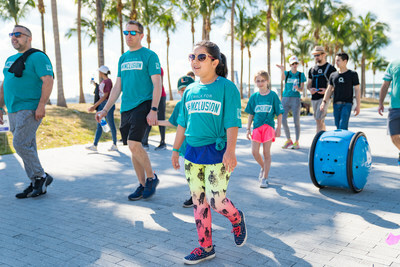 "We are proud to stand, and roll, alongside Best Buddies today as we continue to reshape the future of mobility in Miami and around the world," said Jeffrey Schnapp, co-founder and CEO of PFF. "We are thrilled to demonstrate how Gita will make life easier to navigate for everyone and look forward to continuing our partnership with Best Buddies." With Gita, the team at PFF hopes to further improve accessibility and provide opportunities for everyone to move freely. Gita is designed to mimic the full range of human mobility and can follow anyone who walks, rolls, or scoots with a zero-degree turning radius. It has large wheels, like a bicycle, so it can operate on irregular surfaces, indoors and outdoors, on sidewalks and streets, and up and down ADA compliant ramps. "It is incredibly inspirational to see so much enthusiasm for the Best Buddies mission of friendship and inclusion in South Florida, and to have Gita join the fun," said Anthony K. Shriver, Founder, Chairman & CEO of Best Buddies International. "Mobility solutions like Gita are yet another step in the right direction as we work to make the world a more inclusive place for individuals with intellectual and developmental disabilities."